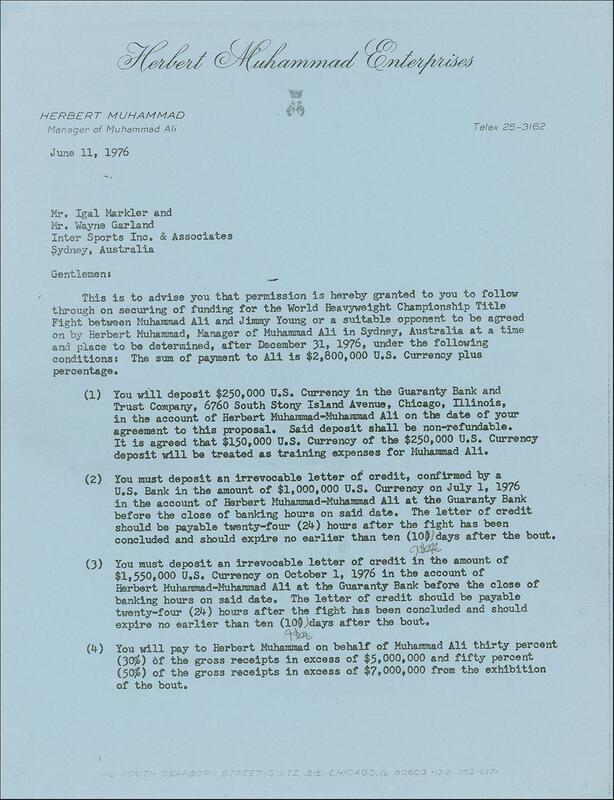 Ali - DS, two pages, 8.5 x 11, on Herbert Muhammad Enterprises letterhead, June 11, 1976. 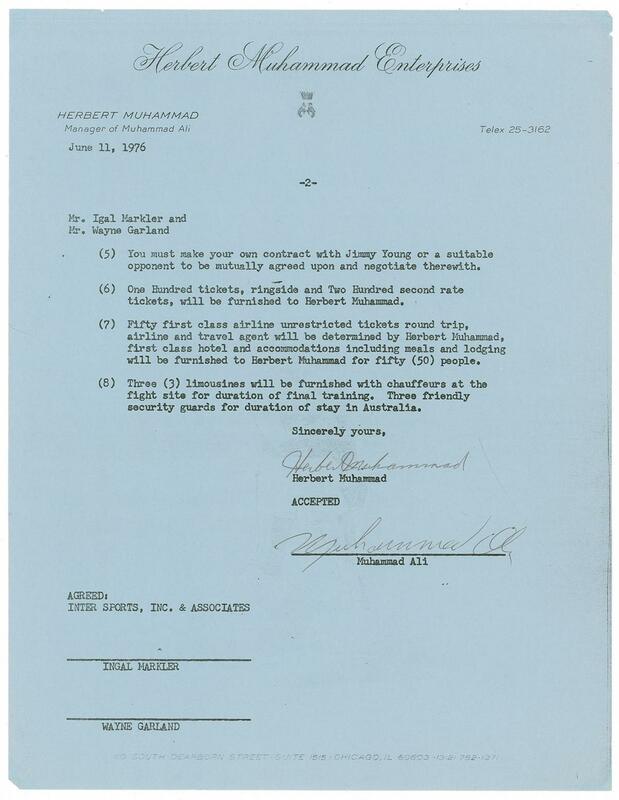 An agreement between Ali and Inter Sports Inc. of Sydney, Australia, regarding a proposed match with heavyweight contender Jimmy Young, signed at the conclusion by both Ali and Herbert Muhammad. 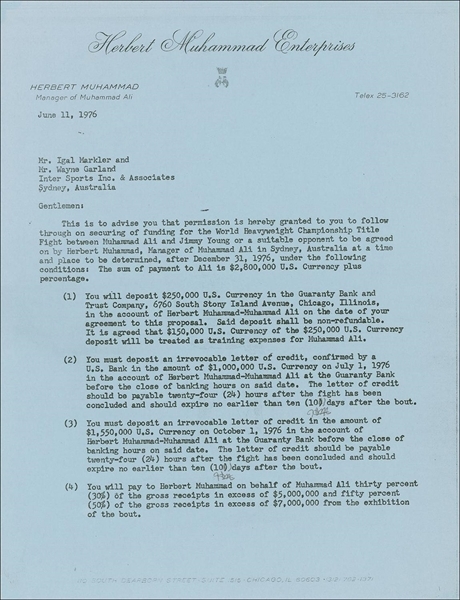 Besides depositing a non-refundable proposal payment of $250,000 and two irrevocable letters of credit in the amounts of $1,000,000 and $1,550,000 in Ali’s Chicago account, Inter Sport’s agents agree to pay the fighter “30% of the gross receipts in excess of $5,000,000 and 50% of the gross receipts in excess of $7,000,000 from the exhibition of the bout.” In addition, Inter Sports must make its “own contract with Jimmy Young or a suitable opponent to be mutually agreed upon,” and arrange for “One Hundred tickets, ringside, and Two Hundred second rate tickets,” “Fifty first class airline unrestricted tickets round trip…first class hotel and accommodations including meals and lodging…for fifty people” and “three limousines…with chauffeurs at the fight site for duration of final training. Three friendly security guards for duration of stay in Australia.” In fine condition, with a small tear to the upper edge of page one and a few mild wrinkles. 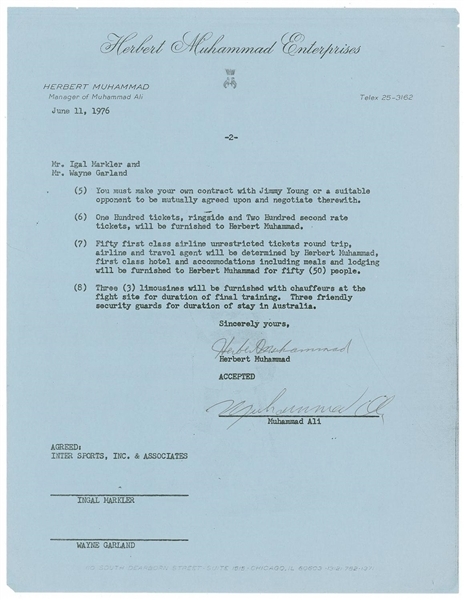 Two months before signing this agreement, Ali and Young squared off in Landover, Maryland for the world heavyweight title. Young, a generally passive pugilist, outlanded and outworked Ali throughout the night, with ‘the Greatest’ unable to connect with more than a few solid blows. Many thought Young might be crowned the heavyweight champion of the world that night, but the judges awarded Ali a unanimous decision After that fight, most believed Young deserved another shot at the title—and as this contract suggests, that fight was going to be a reality. Before that, however, in September 1976 in New York City, Ali defended his title—this time against Ken Norton—winning a close but unanimous 15-round decision. Young would face other former and future heavyweights, including Norton and George Foreman, but this planned rematch with Ali would never happen. Desirable ‘phantom fight’ contract.